Hello blogging world, Anthony Macchio-Young here. I am going to be responsible for updating my blog from this post on, give my Pops a break. Figured I’d start with the root of the story with the bicycle accident and how I got my TBI (Traumatic Brain Injury). It all started 6 days after moving to San Mateo to find a Graphic Design job. One of my professors, Jensen Hendriks, had put me in contact with a friend of his who builds apps for iPhones and just moved to San Francisco himself. On the sixth day my bicycle, that I shipped from Florida, had come in the mail the morning of February 1st, 2013, so I thought I’d take the CalTrain up to San Francisco and pedal to the networking party my new connection was having. 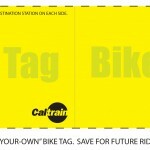 Tag they required I used for my bike on the CalTrain. I left with my bike on the CalTrain in San Mateo at around 6pm. Arrived in San Francisco around 6:45pm and then pedaled myself to one of my true passions in life…craft beer, 21st Amendment brewery and then went to City Beer Store for another craft beer. I pedaled away and realized I was headed in the wrong direction, stopped and asked a couple the way to Russian Hill, they told me and I started pedaling in the right direction. I then turned onto a main road and started going downhill. As I traveled downhill I didn’t notice the trolly track because they were foreign to me. My front bicycle tire then gets caught in the track and I flip over head first (had my helmet on thankfully). I stood up immediately and three bicyclist on the sidewalk saw it all go down and said I needed to go to the emergency room and then stopped a taxi van for me. He put my bike in the back, then asked me where I wanted to go, and I said CalTrain. I waited for around 15 minutes for the CalTrain, got me and my bike on, took a few pictures of my head because I knew something was wrong, but TBIs were so foreign to me I thought it was just a concussion, so I thought staying up throughout the night would do well enough. 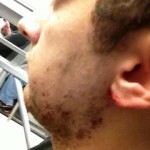 Picture taken on the CalTrain to check for any visible wounds. We arrived in San Mateo and I got out, walked my dilapidated bike back to my apartment, then realized I had lost my keys somewhere along the way (thankfully), called a few locksmiths with no luck at 11pm on a Friday night, texted my then girlfriend, who was a flight attendant, that I’d need her to stay up with me that night, then took my jacket off and bunched it up like a pillow, and passed out on the apartment’s community porch (last thing I personally remember). My neighbor, whom I never met, found me and dialed 911. The cops came and thought I was beyond drunk because a bottle of beer that I bought at City Beer Store, 3 Fonteinen Oude Geuze, had broken in my book bag. My neighbor then saw me having seizures because she was very familiar with seeing that with her epileptic brother and recommended that they call an ambulance. The medics were then smart enough to take me to Stanford Hospital rather than San Francisco General. Dr. Odette Harris, Stanford’s managing TBI neurosurgeon, performed surgery on my Subdural Hematoma on the left side of my brain and I was in ICU for two weeks and one day and then transferred to Kentfield Acute Rehab in Marin County. Next post will cover my story with recovery in therapy thus far! What a true miracle God has done in your life! It’s crazy what a freak accident can do to rearrange our lives! I truly believe in miracles however God chooses to perform it! Me and my husband were in a motorcycle accident in September, no helmets, not wise! I hit my head but somehow all I had was a big goose egg! My husband got a crushed elbo, it could have been so much worse. I try to tell anyone who will listen to wear a helmet! Most don’t listen. I’m sure yours saved your life! May God continue the miracle process in you! What’d you think of alt j’s new album today??? I am Brett’s wife, Diana. I met you and your family at Stanford Hospital. Your dad gave me your picture and I have thought of you often and hoped for your successful recovery. It is great to read your first journal entry. You, like Brett, have been on a long and arduous journey. I was told the day I walked into Brett’s hospital room in the ICU in Joplin, MO that his recovery would be a marathon. He is nearing the two year anniversary of his injury and still working hard. It sounds like you are making great progress – I’m very impressed with your journal writing. Stay strong and keep working hard. You can, and are, doing great things. It always occurs to me how hard rehab therapy is. It consists of criticism in order to lead to improvements and I feel like that is hard on the psyche over an extended period of time. Stay positive and celebrate your accomplishments. I look forward to reading more about your journey. Hi Anthony! Ann Schiff here. I worked with you in the Image & Design Dept. at Full Sail. Glad to hear all is well. I’ve kept you in my prayers from day 1 along with my sister Jean and others. God Bless You! Will continue to follow you on this journey. Great job telling your story. We met you and your Mom at Kentfield rehab center. Our son Sean also suffered a TBI in Feb 2013. We watched you through your stages of recovery hoping that wr would soon be there. Keep moving forward and we cant wait to hear the rest of your story. Blessing to you and your family. Thanks for starting this Anthony!! It is a very interesting story, plus, I believe you will recover and will one day speak to other TBI patients and their families. The most important thing to do is to encourage others to work hard on recovery and never give up. Thanks for sharing your story with all of us. We are keeping you in our prayers!